These two games are the only applications written in Borland Delphi 5 I could find on old backups. Other treasures of the time between 2002 and 2004, like a CD tray open/close tool, a fake Microsoft Windows 2000 Professional unlock screen for password grabbing, or a DirectX-based Galaga clone, are lost forever. The simple Wa-Tor-like game simulates the dependencies between animals and their environment. It was programmed in 2004 during a secondary school project for biology class. The simulation is written in Borland Delphi 5 and should run on Microsoft Windows 95 upwards. Unfortunately, the source code and the documentation are lost, but it may not be too hard to figure out the simulation options. The user interface is in German only. 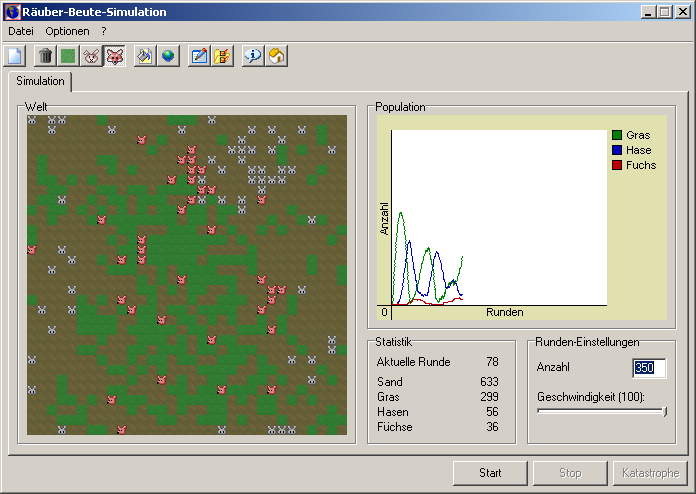 The user can place single grass, rabbit, and fox tiles on the map. Parameters for energy, breeding values, and so on, can be altered as well. The simulation runs autonomously after clicking the [Start] button. To install the simulation, just unzip the archive and start the executable Simulation.exe. The configuration is stored in a local INI file. The Windows Registry will not be touched. 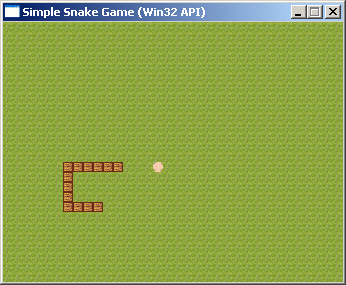 A simple snake game clone with ugly sprites, written in Borland Delphi 5 by using Win32 API calls only. The source code is lost, too. There is nothing special about the game, except the file size of 29.5 KiB. A later version also featured sound, but this is the only one I have a backup of. Just run the executable snake.exe to start the game. No installation necessary.